"Pulse," by the San Francisco-based artists collective Flaming Lotus Girls, is an artwork at the intersection of sculpture, kinetics, robotics, pyrotechnics, and electronic technology. 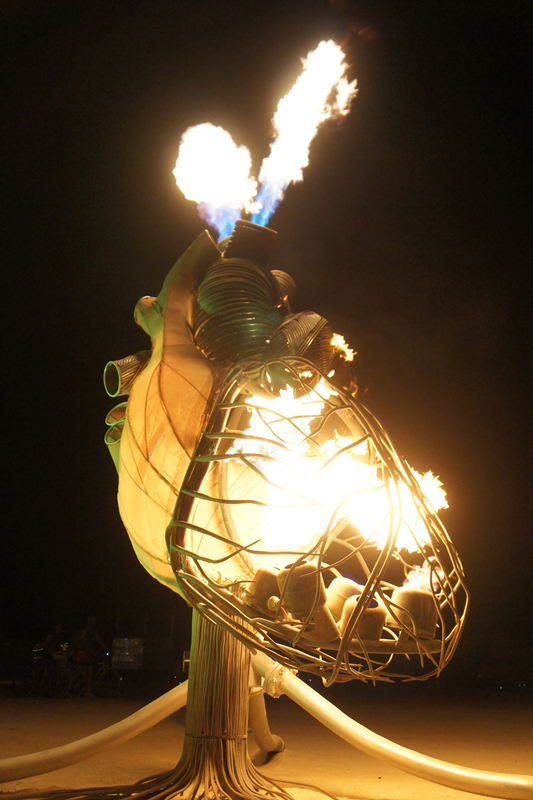 The visual centerpiece of Pulse is an anatomically-correct heart, beating fire through its four chambers in a visually stunning spectacle emulating the blood flow through the human heart. It can be seen at Anne & Mark's Art Party 2016. Gallery: 11 a.m. to 5 p.m. Sunday, Friday, Saturday following the gala, $10. Possible other days to be announced. 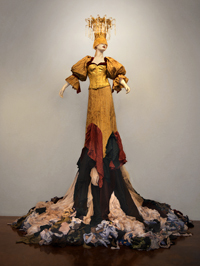 Artist Charlotte Kruk models her cape, "Diva, Diva, Godiva," made from recycled Godiva chocolate wrappers. She is with pro football play Vernon Davis, who is wearing Kruk's "Godiva Jacket." The former will be seen at Anne & Mark's Art Party 2016. The latter, a commission, is part of Davis's personal collection. "Anne & Mark’s Art Party" opens on Saturday with what promises to be a spectacular gala. This multi-day event, held at the Santa Clara County Fairgrounds, continues with gallery hours and workshops on Sunday, Friday and Saturday, then concludes on Saturday night, October 1 with a closing bash and runway show of cutting-edge fashion and one-of-a-kind wearable art. Anne Sconberg and Mark Henderson  the San Jose couple best known by their first names  began in 2007 by showing friends’ art in their new house for a one-night party to celebrate local talent. This is their seventh Art Party, the largest and most elaborate of all. For the first time this year, artists from outside the region will be included, some from as far away as Syria, Germany, Japan, England, India and France. The fairgrounds’ Pavilion Hall, converted into a 34,000-square-foot maze of galleries, will display an array of work in diverse media by 300 artists, the great majority still from the Bay Area. 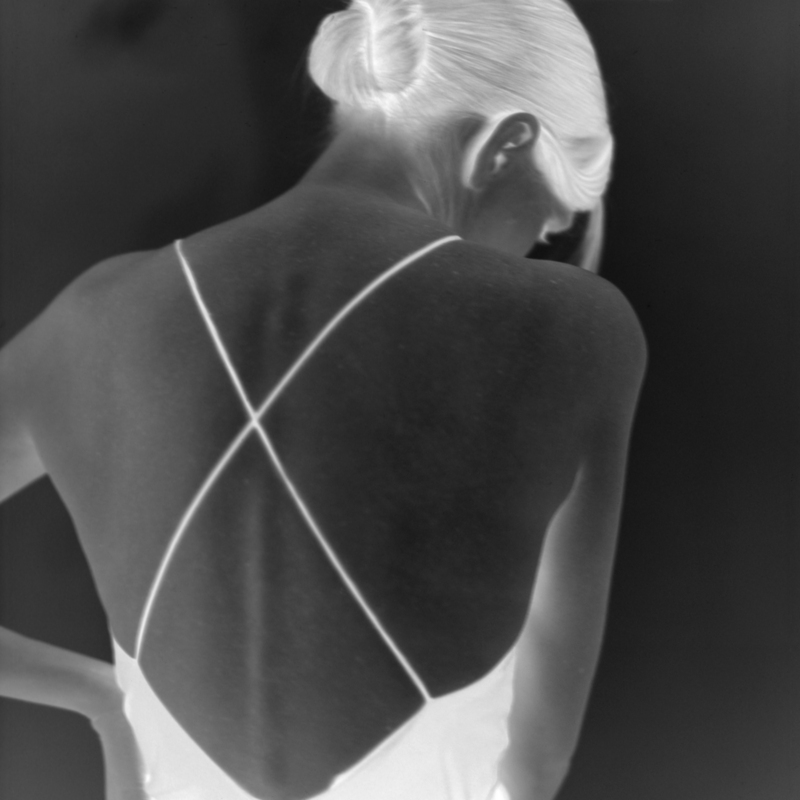 "Knot," a photographic print on metal by Molly McCall, is part of her series "Cherchez la Femme," and will be shown at Anne & Mark's Art Party 2016. Art abounds outdoors as well, starting with Bill Gould’s "Blowing in the Wind" installation suspended from the fairgrounds’ giant entry arch. Next, attendees walk through the "Rabbit Hole" created by Burning Man veterans Gwen and Bob (Wizzard) Marzewski. 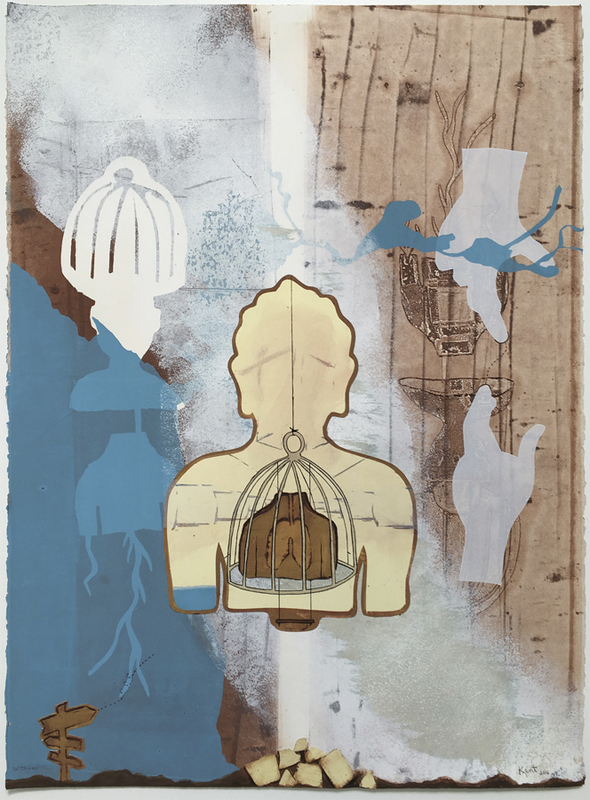 Henderson described the installation, which sets this year’s "Alice in Wonderland" theme: "There are many ‘rooms’ and illusions and references to the story as one progresses through the 100-foot hole. ... It is in the main pathway between the entry gate and the Pavilion exhibition. … There are mushroom fountains to drink from, mushrooms offering pills to ingest, a tiny door that needs to be opened when on one's knees to look into the most beautiful garden that Alice ever saw ... a floor of water ... a corridor that brings you back to where you were... an expanding room where you feel very small ... a shrinking room where you feel very tall." The theme continues beyond the "hole" as guests pass a 100-foot-long "Mad Hatter" table with hand-painted chairs and a giant chessboard with three-foot-tall pieces. 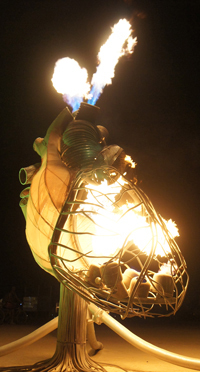 Opening night features "Pulse" by the Flaming Lotus Girls, who are coming from Burning Man to bring their newest creation, an anatomically-correct heart that beats with fire. A party spokesman promised, "We will also have fire juggling, fire dancing, and I’m sure some surprises. Fire art is always part of the Art Party … but we generally don’t know how many acts will be permitted until we get insurance issues all worked out." The Saturday gala also includes music stages, a jazz club, a spoken word lounge, performance art, dance, art cars and gourmet food trucks. In a live painting performance, artists from Empire Seven Studios will transform the sides of huge shipping crates with street-style savvy. That is in the fairgrounds’ Fiesta Hall. Other artists will paint on expanses outside during the evening. The San Jose International Short Film Festival will be projecting four hours’ worth of 5-to-10-minute films in a tent set up with a large screen and a popcorn machine, plus sofas and arm chairs; guests can enjoy the "chill vibe" here if other gala activities become too frenetic for their tastes. Eccentric fashion and wearable art will be offering a sneak peek at what is to come on the closing night party. Many guests dress creatively as well, which further amps up the energy for the evening. The opening gala has three price points. Admission from 7 p.m. to midnight costs $39. Bargain-rate admission at 10 p.m. is $10. The VIP package, at $150, includes a catered buffet and open bar from 6 to 8 p.m. and an all-events VIP pass. Most of the art is for sale, with prices from $50 to $80,000, and those with early VIP entry get first pick of works. While many of the special events are offered only at the opening gala, the Pavilion Hall galleries will have open hours 11 a.m. to 5 p.m. on Sunday, Friday, and Saturday, October 1, for $10. 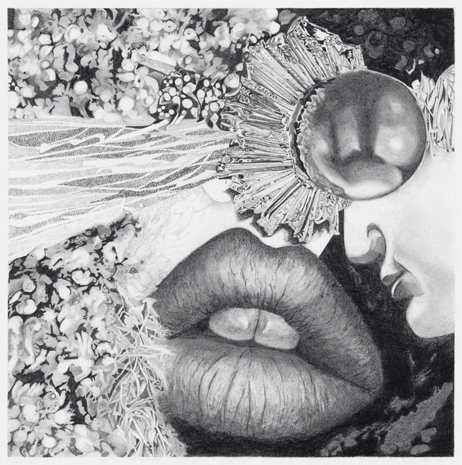 See a list of artists at the Art Party website, https://artpartysj.com/. Two-hour writing workshops take place in the spoken-word lounge on Sunday: "Poetry through Art" begins at 11:30 a.m. and "Flash Fiction and Flash Creative Nonfiction," at 1:30 p.m. A workshop ticket  $10 for students and $25 for others  includes one or both workshops and all-day access to the galleries. 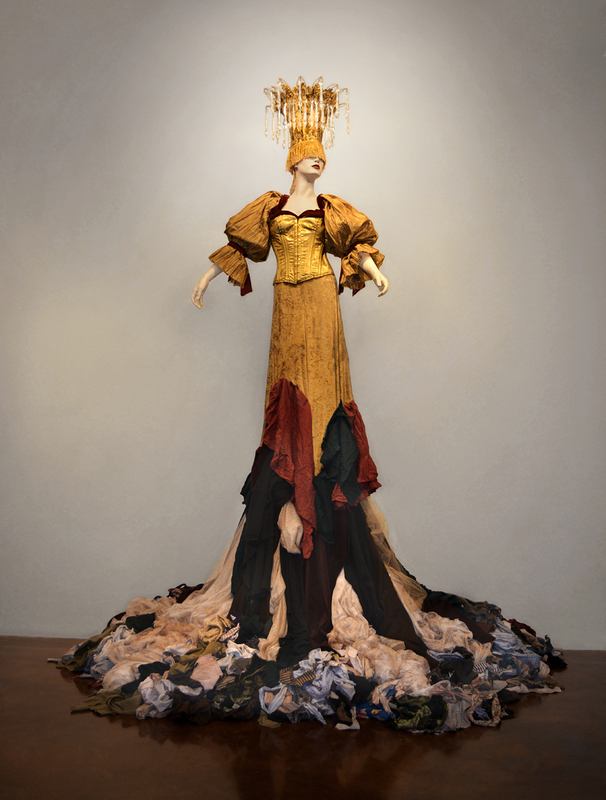 The closing night bash, Saturday, October 1, 6–10 p.m., for $29, showcases "Pivot: The Art of Fashion," a runway show of cutting-edge fashion and unique wearable art pieces by Rose Sellery, Charlotte Kruk and others. The evening also includes a designer trunk sale, food trucks, music, open gallery and more. "Rags to Riches" by Rose Sellery will be shown at Anne & Mark's Art Party 2016. The Art Party’s growth has compounded over the years: number of artists, amount of art, size of the venue, numbers of guests and the range of added attractions. It started in 2007 with 15 or 20 artists and 250 people in a 5,000-square-foot house. In 2009 the Art Party became a fundraiser for the Arts Council of Silicon Valley (which has since changed its name to Silicon Valley Creates and continues to benefit from the event). In 2010, the fourth Art Party outgrew the neighborhood and moved into a warehouse. In 2011 it officially became a two-day event. It skipped two years until Anne found a new space. In 2014 the party moved to the fairgrounds and opened to the public for the first time. This year volunteers who organize the event expect 5,000 people. Anne and Mark’s neighbor and friend Georgie Huff has worked on all of the couple’s Art Parties since the beginning. Huff explained, "they preferred the creative process whereas I  my practical self  worried about the mechanics of the event. It became a perfect union." Huff, a San Jose real estate broker who has helped plan other large-scale events, has the title Head of Everything (except the art). With insurance, visits by the fire marshal and other issues, her responsibilities have grown over the years as well. Together, the three lead an all-volunteer, all-consuming effort to produce an artist-driven event. Email Anna Koster at annakosterart@gmail.com. Visit her website at annakoster.com. 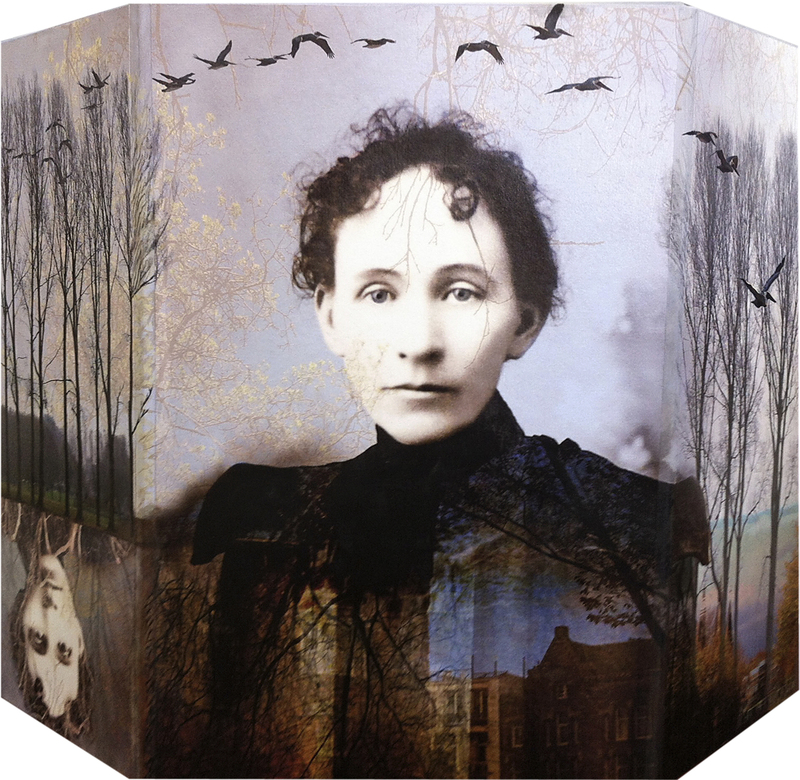 "Birds-of-Immigration-Amsterdam-to-NY," three-dimensional mixed media panels by Sara Friedlander, will be shown at Anne & Mark's Art Party 2016. "Lip Unkshun," pencil on paper drawing by Sarah Ratchye, will be on view in a gallery in Pavilion Hall at Anne & Mark's Art party 2016. "Within," a monoprint by Kent Manske, will be shown at Anne & Mark's Art Party 2016.